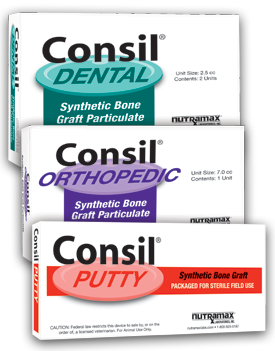 Consil synthetic bone graft material is a bioactive ceramic containing salts of calcium, sodium, silica, and phosphorus. It undergoes a time dependent surface reaction when implanted at the dental or orthopedic repair site. The surface reaction results in the formation of a calcium phosphate layer that is substantially equivalent to the hydroxyapatite layer found in bone material. Osteoblasts infiltrate and proliferate on the surface of the material, and bone growth occurs uniformly throughout the defect. Au AY, Au RY, Al-Talib TK, et al. Consil bioactive glass particles enhance osteoblast proliferation and maintain extracellular matrix production in vitro. J Biomed Mater Res Part A 2008; 86(3):678-684. Au AY, Au RY, Demko JL, et al. Consil® bioactive glass particles enhance osteoblast proliferation and selectively modulate cell signaling pathways in vitro. J Biomed Mater Res Part A 2010;94(2):380-388. Oonishi H, Kushitani S, Yasukawa E, et al. Particulate bioglass compared with hydroxyapatite as a bone graft substitute. ClinOrthop 1997: (334)16-325. Allan I, Newman H, Wilson M. Antibacterial activity of particulate bioglass against supra- and subgingival bacteria. Biomaterials 2001;22:1683-1687. Stoor P, Soderling E, Salonen JI. Antibacterial effects of a bioactive glass paste on oral microorganisms. Acta Odontol Scand 1998;56:161-165. DeForge DH. Evaluation of Bioglass/PerioGlas (Consil) synthetic bone graft particulate in the dog and cat. J Vet Dent 1997;14:141-145. Federal law restricts this device to sale by, or on the order of, a licensed Veterinarian. * Source: Among veterinary brands. Survey conducted in February 2016 of small animal veterinarians who recommended oral joint health supplements.